Bhudargad fort is located about 63 km south of Kolhapur. This has a characteristic mountain cap and easily accessible by road. The remnants here are still quite intact. 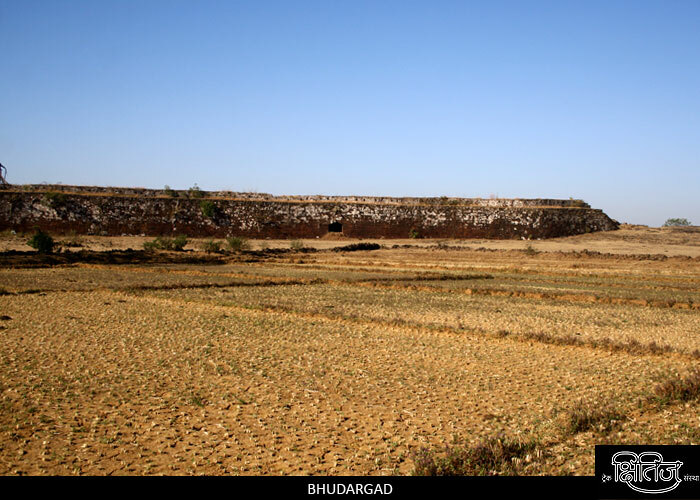 This fort was built by Shilahar king Bhoj II. Then being with Adhilshah for many years, it was captured by Marathas in 1667. Shivaji Maharaj renovated the fort and made it an important army post. However, it was recaptured by Adilshah and then again by Marathas in 1672. Rajaram Maharaj had stayed on the fort while returning from Gingee. Towards the end of 18th century, Parshurambhau Patwardhan took over the fort. The Chatrapati of Karveer won the fort after a decade. In 1844, during the mutiny in Kolhapur, the militia on this fort took part in the same. Babaji Ayrekar was the commanding officer on the fort and he was supported by Subhana Nikam and his 300 soldiers in defending the fort. The British cannoned the fort to destroy the main entrance. The fort top is well accessible by tar road. On the way to the top is a temple of Lord Shiva with a neatly carved Nandi. As we reach the top, we can see the temple of Bhairavnath on the right, which is of Hemadpanthi style. There are arches and Deepmaal around the temple. There is a flag post near the temple. Behind the temple is a palace built in laterite rock. This was supposedly the main court on the fort. There is another temple behind the palace which was renovated by Chatrapati of Karveer, and this hosts a bust of Shivaji Maharaj. This temple is suitable for staying on the fort. If we go southwards on the main way from the palace, we come across a huge pond called �Doodhsagar�. The water in this pond looks milky white due to the characteristic of the soil here and hence the name. There is a Bhavani temple near the lake with a beautiful statue of Goddess Bhavani. There are couple of tombs on one side of the lake. There is another temple ahead which is located in a cave. Beyond the temple, towards north, is a small pond near which there are few more tombs. Here, the ramparts are still in good shape. We get a good view of Peth Shivapur from here, which is the base village. If we go bit towards east, there is another Shiva temple with neat carvings. To the east most side is the dilapidated entrance. If we descend some time from here, we can see a room carved out in rock, which has about 100 sq. ft. area. Near the entrance is a Nandi, near which there is secret tunnel. In the tunnel there are some idols, amongst which is the statue of Goddess Jakhubai. If we take a round along the fort walls, we can see some more remnants. Peth Shivapur is near Gargoti. Kolhapur Gargoti route is well known route with ST buses plying regularly. From Gargoti, we can get a jeep or a six-seater till Pal village, which is 5 km away. From Pal, Path Shivapur is half an hour by vehicle. If we have a private vehicle, we can go to the top of the fort. Recommended to carry water, though there is a hand pump near Bhairavnath temple.